In 1660, widower Isaac Inchbold reluctantly leaves the musty confines of his establishment and travels to Pontifex Hall, the Dorset estate of Alethea Greatorex, Lady Marchamont. Isaac is engaged to find the only existing (unpublished) copy of a manuscript lost when the Hall was occupied by Cromwell’s soldiers during the recently concluded civil war: the Labyrinthus Mundi of Hermetic philosopher Hermes Trismegistus, a renegade work very likely a candidate for “the Vatican’s catalogue of forbidden books.” Once this delicious premise is established, King alternates Isaac’s tale of his increasingly convoluted adventures with others (presumably reconstructed out of his research) involving Emilia Molyneux, a handmaiden to Queen Elizabeth of Bohemia, the Holy Roman Emperor’s librarian Vilem Jirasek, and the reappearing specters of three murderous black-clad horsemen. An “underground river” threatens the foundations of Pontifex Hall—just as Isaac’s safety, and perhaps sanity, are assailed by contradictory evidence interpreted from the writings of such sages and mages as Plato, Copernicus, Galileo, the cartographer Ortelius, “the Rosicrucian Brethren,” and other authorities. And he learns much more than he cares to know about Alethea’s scholar-adventurer (and thief?) father Sir Ambrose Plessington, sinister “art broker” Henry Monboddo, the ironic (hidden) meaning of the Latin motto Littera Scripta Manet (“the written word abides”), and enigmas surrounding the wreck of a German ship carrying “mysterious cargo” to London, and Sir Walter Raleigh’s ill-fated exploratory voyage to Guiana. 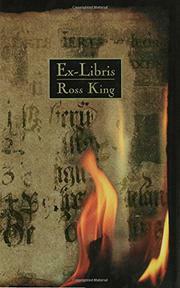 Ex-Libris wears its considerable learning lightly, and its climactic succession of surprises does not disappoint. Readers who willingly lost themselves in Iain Pears’s An Instance of the Fingerpost should know that King has written its entirely worthy successor.